The use of non-human primates as experimental animal models is highly effective for research on human diseases. Non-human primates and humans share comparable immune systems as compared with mice and are suitable for the evaluation of innate and adaptive immune responses against viral infection. A New World monkey, the common marmoset (Callithrix jacchus) has several advantages as an experimental animal model. The small size of the marmoset makes it easier to handle and reduces maintenance costs. 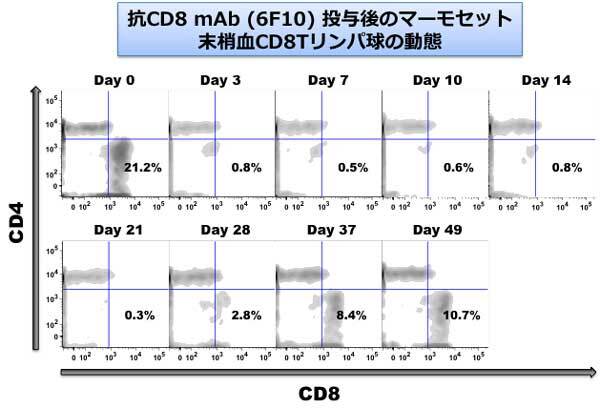 CD8+ T lymphocytes are a vital component of the adaptive immune response and are crucial to the control and clearance of intracellular pathogens. These cells play critical roles in purging acute infections, limiting persistent infections, and conferring life-long protective immunity. In order to clarify the pivotal role of CD8+ T cells in a variety of non-human primate models for human diseases, in vivo depletion of CD8+ T cells by administration of a CD8-specific monoclonal antibody (mAb) is a straightforward technique, although it has been established in Old World monkeys but not in New World monkeys. In this study, we demonstrated for the first time in New World monkeys that the administration of the 6F10 mAb specific for common marmoset CD8 efficiently depleted CD8+ T lymphocytes in marmosets. Thus, our in vivo CD8 depletion technics will be valuable for further examining the role of CD8+ T cells in the infectious diseases as well as autoimmune diseases by using marmoset models. Kinetics in the CD8+ T lymphocyte population of a CD3+ T cell subset in a common marmoset administrated with an anti-CD8 mAb 6F10.